Volkswagen AG's Manhattan flagship store will debut new store designs for the VW and Audi brands. Departures from current designs include a white color scheme for VW, left, and a space-saving, stackable design for Audi. The new standards are required for new and renovated dealerships. Volkswagen AG will install flagship dealerships for VW and Audi in a 6-story building in New York City that formerly housed a Potamkin family GM store. 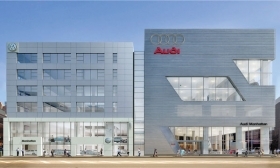 NEW YORK -- Volkswagen and Audi will debut new dealership design standards at a flagship store planned for Manhattan. Last month, Volkswagen Group of America bought the Potamkin family's 263,000-square-foot General Motors Co. dealership in the city. VW will spend about $125 million for the property, with about a third of that going toward renovation of the site. The brands will share the store, at 11th Avenue between 55th and 56th streets but will have different facades, entrances and service areas. The VW store will open in the spring; and the Audi store, in late 2011. Both stores will be leased to Rodman Ryan, who has been awarded the Audi and VW franchises. Ryan, who owns Open Road Auto Group, already runs Audi Manhattan in New York, Audi Brooklyn and VW stores in Brooklyn and on Staten Island. Details of the lease weren't disclosed, but Randy Pressgrove, general manager of network development for the VW brand, says it runs for more than 10 years. Ryan took over Audi of Manhattan, on 54th Street between 11th and 12th avenues, in January 2007. He increased sales from 1,115 new vehicles annually to 1,573 last year, says Mark Del Rosso, Audi of America's COO. That store will be closed when the new one is completed. VW lost its New York City store in July 2007 when the Potamkin family gave it back and used the location for a Honda franchise. Audi and VW expect annual sales at the site to reach 3,000 for each brand later in the decade. Audi of America President Johan de Nysschen says Audi also will use the new store for corporate marketing and social functions. Audi likely will move those activities from the Audi Forum on Park Avenue when that lease expires in 2012. The Audi Forum is a showroom and does not sell cars. 1. White aluminum composite materials frame the building. 2. A white entry portal features the VW logo. 3. A white box inside the showroom holds a featured vehicle. "It is quite a departure from our current look," which features a large, two-tone, yellow-banded entry with the VW logo and an aluminum roof, Pressgrove says. -- A stackable design that conserves space and saves up to 40 percent in construction costs. -- A curved back interior wall that simulates the sharp curve of a racetrack and underlines the brand's sportiness. -- Fewer glass walls, to reduce energy costs. Volkswagen and Audi say the new standards are required for new and renovated dealerships. Some stores using the new designs are already under construction. VW and Audi service and parts will be on the fourth and fifth floors, but not together. Says Pressgrove: "There will be quite a bit of separation between the brands but some intermingling on service and parts."